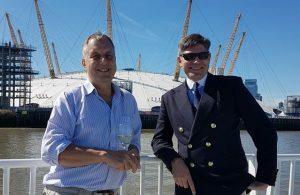 As our year of celebrations for the Company’s Sexcentenary draws to a close, we look back over the major events held to mark this exceptional anniversary. 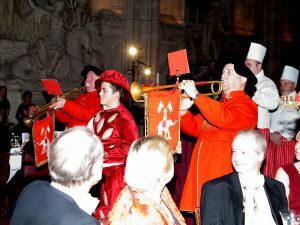 For several years the Sexcentenary Committee had been planning a series of events, both formal and informal, to celebrate the granting of our first Royal Charter by Henry V. They soon found that there were two frequently recurring themes, the mainstays of the livery tradition – ‘Fellowship’ and ‘Charity’. Full details of the fine work of these organisations can be found here. 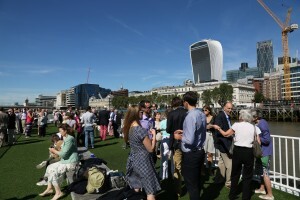 The Committee is pleased to report that the appeal raised over £200,000. Throughout the year donations were gratefully received from a wide variety of sources – individuals and corporations, fund-raising events including a clay-pidgeon shoot and the Burns’ Night raffle, and sponsored activities by some very energetic Liverymen and Freemen such as walking the Thames Path, cycling from London to Sheffield and back, running triathlons and parachute jumping. We look forward to continuing our associations with the Sexcentenary charites and indeed, all our other affiliations in the years to come. 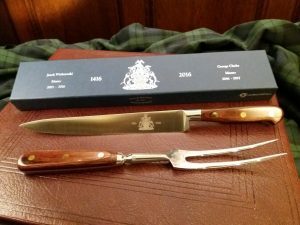 As a commemorative gift to the Livery the Company commissioned a carving knife. Past Masters Janek Wichtowski (2015-16) and George Clarke (2016-17) then sponsored a matching fork to complete the set for every member. The set was designed and manufactured by Samuel Staniforth Ltd of Sheffield – a traditional knife-forging company with over 150yrs experience. 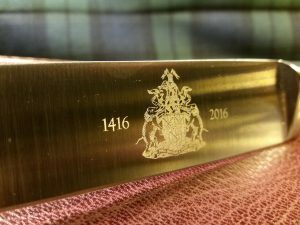 Each knife has the Company’s crest etched onto the blade together with the Sexcentenary dates. And what of the theme of ‘Fellowship’? Well, there was no dearth of goodly company across the year. 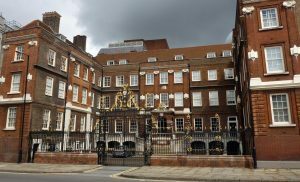 We began with a visit to the College of Arms. 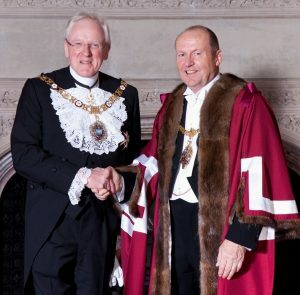 In J uly 2016 our newly-installed Master, George Clarke, accompanied by the Wardens and members of the Livery and their families, visited the College of Arms (established in 1484, some 68yrs after the Cutlers) to see for themselves the earliest records of our Grant of Arms. 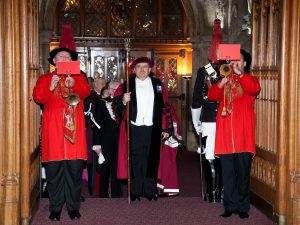 Our host was Garter Principal King of Arms, an office founded by Henry V in 1415. 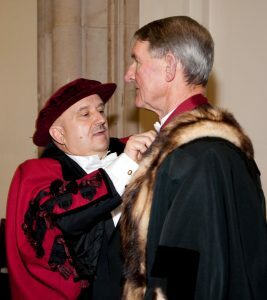 The current Garter is Thomas Woodcock who explained the history of the College and its role in today’s world. 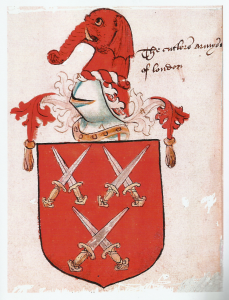 Although we received our Charter in 1416 the Company didn’t petition for a Grant of Arms until its 60th anniversary in 1476. The petition was granted by the then Clarenceux King of Arms. 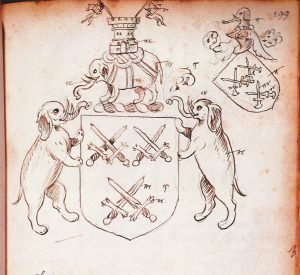 Sadly the original records have been lost but the College was able to show us a number of later illustrations which are the oldest extant records of our Arms. 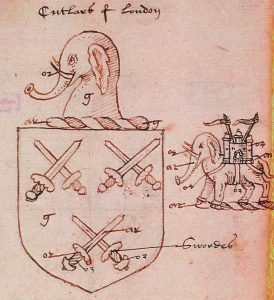 A new Grant of Arms adds two elephant supporters and the inclusion of the castle motif. The fascinating visit was rounded off with refreshments and the Master thanked Garter and the College for their kind hospitality. 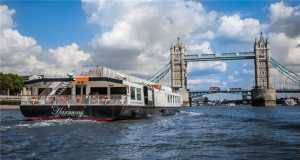 In contrast to the history and pageantry epitomised by the College, in September the Company took to the water and together with their families, enjoyed an afternoon out on the river Thames. 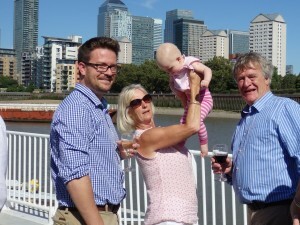 Under the bluest of skies on a sunny Sunday members and their families, old and young, boarded the Thames cruiser ‘Harmony’ at Embankment Pier and headed off for a trip up and down the river from Parliament to the Thames Barrier and back. 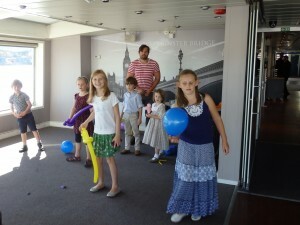 … whilst for the younger ones who were perhaps less interested in champers and sun, there was plenty to keep them amused courtesy of the on-board entertainer! With thanks to the ‘backroom team’ led by the Gallant Clerk here with Beadle’s Assistant, John and the Beadle & Mrs Hasler. 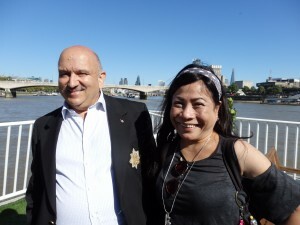 And last but not least, a special ‘thank you’ to the Assistant Clerk, Iben Muriel, who made the whole day possible. 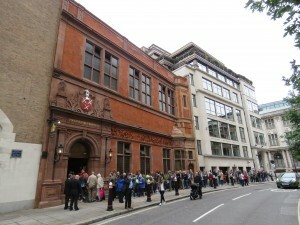 Also in September the Company opened its doors as part of the official London Open-House Weekend. 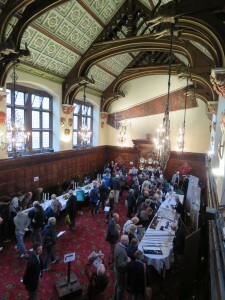 We were quite taken aback by the response of the public eager to get a glimpse inside the Hall. We welcomed 1,272 visitors across the threshold in under 6 hours – that’s three-times as many as we meet in a year on our regular tour programme. Queuing times reached 45mins at the peak and we had to extend the opening hours so as not to disappoint our enthusiastic visitors. Thanks are due to Claire Pocock and her colleagues for some very effective marshalling of the crowds. 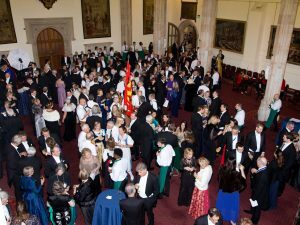 We had a simple ‘one-way system’ to guide visitors around the Hall and members of the Livery and staff were on hand to describe and explain the various aspects of the Livery tradition and life at the Hall. 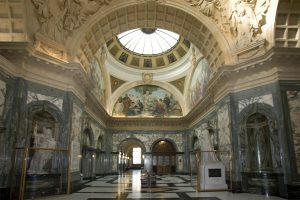 The public were able to view the Court Room, the display of swords on the first-floor landing and our collection of historic cutlery and livery medals. In the Livery Hall there were fascinating displays presented by our members and associates. 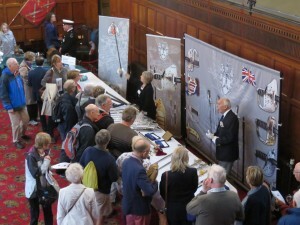 Liveryman Robert Pooley of Pooley Sword Ltd brought along a wide-ranging display of his company’s products and held the crowd enthralled by his lively commentary on the many aspects of modern sword making. 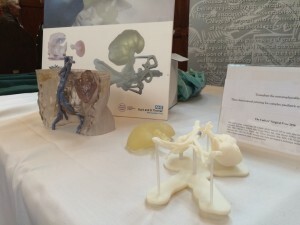 The recipient of the 2016 Cutlers’ Surgical Prize, Dr Pankaj Chandak, explained his winning project – 3D printing to assist with complex paediatric renal transplantation. 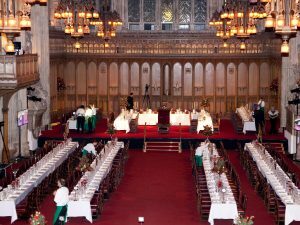 In contrast to the history and pageantry that envelops so much of the Hall, also on display were the exhibits of the finalists of the Cutlery Design Challenge jointly sponsored by the Cutlers’ Company and the Institute of Making, part of University College, London. The aim of the competition was to design and make new implements, tools or devices for eating which have the potential to change the way we eat and which help us re-evaluate our approach to food. 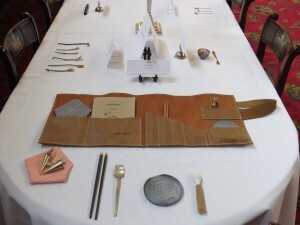 The ten finalists laid out their designs on the Great Table and the reaction of visitors was very positive as they began to appreciate just how varied and imaginative modern cutlery design can be. 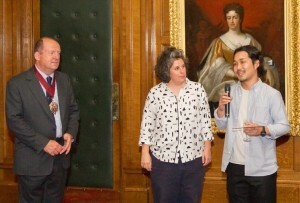 At the start of the day the Director of the Institute, Zoe Laughlin, announced the winner – Wataru Kobyashi with his designs entitled ‘Bugbug’ – and the Master presented him with his prize. Wataru says of his winning entry – ‘Bugbug’ is a picnic cutlery set for eating insects and acts as a tool for promoting insects as a meal. In 2050 it has been predicted that a large-scale food crisis will hit the world, Bugbug will enable its users to have the different approach to eating and hopefully make eating insects a part of everyday life. This will help to head-off the food crisis we are facing and begin to make eating insects socially acceptable. 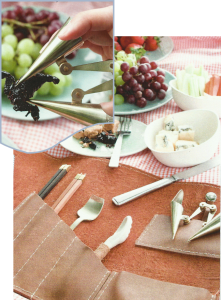 The picnic set aims not only to be joyful and playful but to begin to stretch our perception of what food is. The target users for this picnic set are the people of the future, the ones who are highly concerned with food and the environment. The runner-up was Cerys Alonso with her entry ‘The Lifetime of a Bee’. A single bee, in its very short lifetime, makes about 1/12th of a teaspoon of honey. 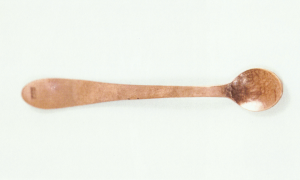 This copper spoon raised using traditional smithing techniques demonstrates the preciousness and the endeavour undertaken to produce something that we take very much for granted. 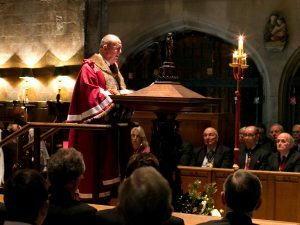 December 2016 saw the highlights of our year of celebrations the first of which was the Service of Thanksgiving held at the historic Priory Church of St. Bartholomew the Great, West Smithfield. 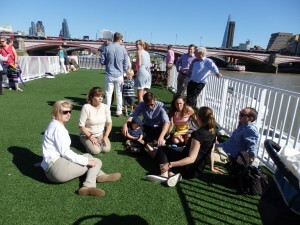 Such was the interest in attending the service that the organisers soon realised that our company church, St Martin within Ludgate, would be too small to receive the expected congregation. 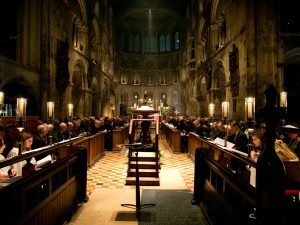 We were therefore very grateful to Dr Martin Dudley, the Rector of St. Bartholomew’s, for allowing us to hold the service in this magnificent setting. The church was founded in AD 1123 as part of a monastery of Augustinian Canons. Over the centuries extensive parts of the building have been damaged or destroyed but restoration was begun in the 1800’s and continues today. 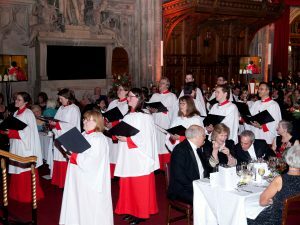 Over 200 guests and visiting Masters and Clerks from the other City companies filled the ancient Priory Church. 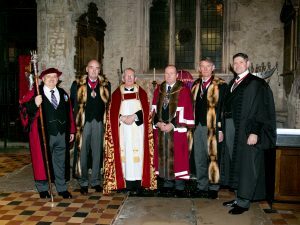 (l to r) The Beadle, the Senior Warden, Colin Evans, the Rector, Dr. Martin Dudley, the Master, George Clarke, the Junior Warden, Dr Timothy Osborn-Jones, and the Clerk. 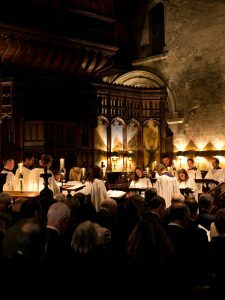 (l) The Service began with a shortened Latin Vespers, the words and music of which would have been familiar to both King Henry V and to our first Master, Richard Wellom. 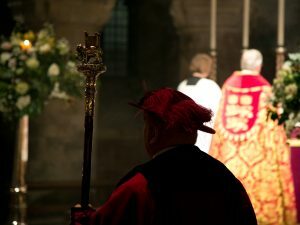 (r)The Master reads an extract from the Charter of 1416. 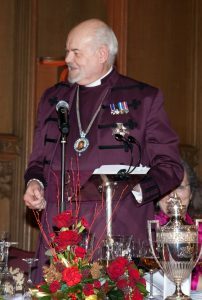 Our Chaplain, The Rev’d. 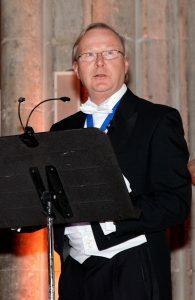 Prebendary Jeremy Crossley, delivers the Address. whenever the Livery is summoned to gather together on important Company occasions. 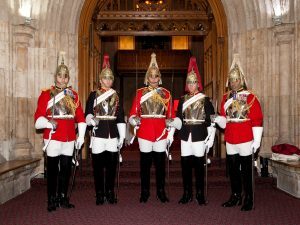 After the Service the Master and Wardens hosted a reception in the Central Lobby of the Old Bailey. 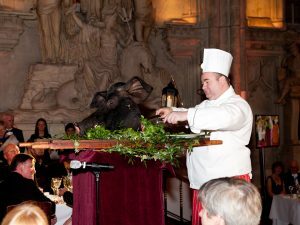 Each year the climax of our Christmas celebrations is the Feast of the Boar’s Head. 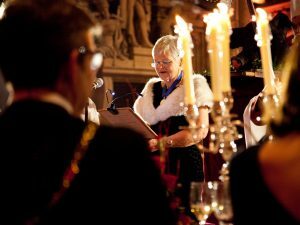 As 2016 was our Sexcentenary, the organising committee set out to deliver a feast of suitable grandeur reflecting our long and proud history – and they did not disappoint us. 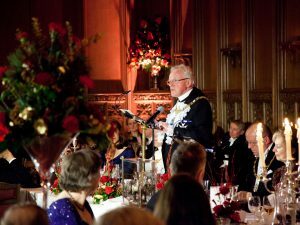 450 guests gathered at the Guildhall to mark the occasion. No man hath cellars better stocked with wine. Of fish and flesh, and these in large supplies. 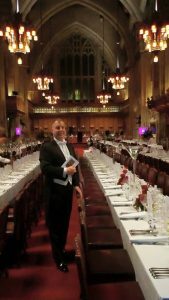 All day Cutlers’ officers and staff, together with The Cook & The Butler Catering Company, prepared the Great Hall for the evening’s events. Court Assistant Carrie Herbert rehearses the Oration …. 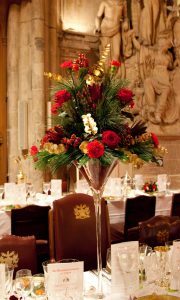 One of the many stunning floral arrangements designed and made by Loraine Westgarth of Just Flowers. 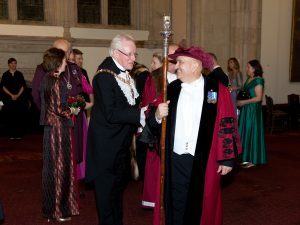 The Beadle gives the Junior Warden a final straighten-up …. 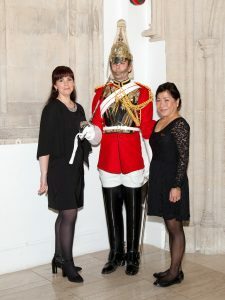 … while Mrs Hasler and the Assistant Hallkeeper, Sandra, drew the short straw of chaperoning the Household Cavalry Mounted Regiment! 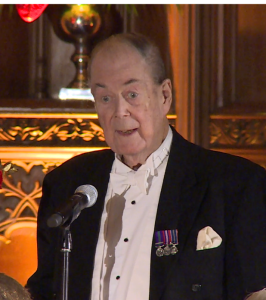 And all under the eye of the Toastmaster for the evening, the Assistant to the Beadle, John. 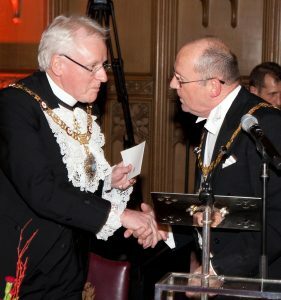 The Master greets The Right Honourable The Lord Mayor and our principal guests. 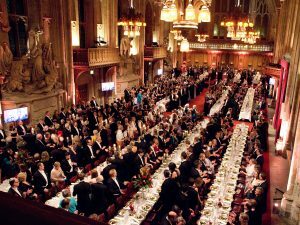 … as the top table processes into dinner. 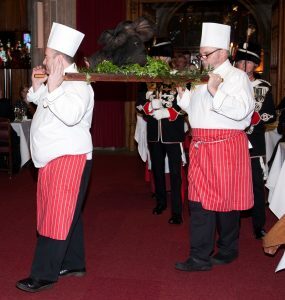 carried by The Cook & The Butler Executive Chef Jean Deillon (l). 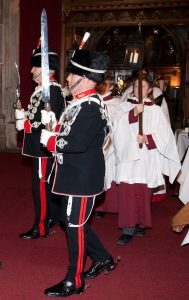 The procession was accompanied by our Ceremonial Carving Knife and Fork, the Cutlers’ Singers, trumpeters and Mustard Pot (Richard Watts, son of Past Master Peter Watts). 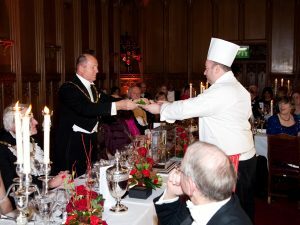 Having carved the first slice, Chef presents the dish to the Master. With the boar looking over her shoulder, Assistant Carrie Herbert reads the Oration and enjoins the assembled company to ‘digest both the pig and the tale’. Over the years we have developed a special relationship with the Guild of Blacksmiths in Zurich, the Zunft zur Schmiden. 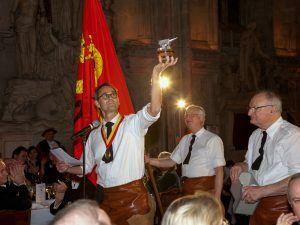 They were delighted to accept our invitation to join us at our feast and the Zunftmeister brought with him a special gift to the Company of a silver anvil – no doubt on which to forge a still-closer friendship. 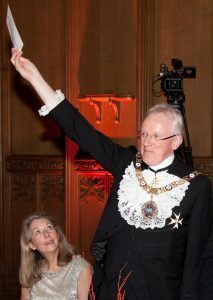 … and The Lord Mayor spoke eloquently in his response. 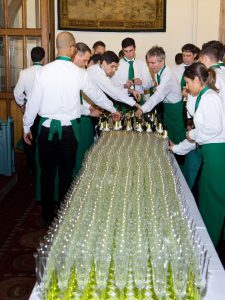 Below left, the role of proposing the toast to the guests fell to Past Master Michael Donaldson, no small task when one has such a long and distinguished list of visitors. 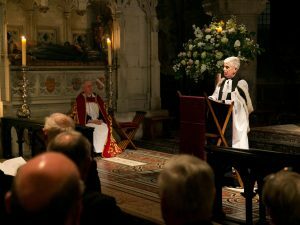 In reply the Bishop of London, Dr. Chartres, right, gave an enlivened response of behalf of the guests and thanked the Master and the Company for a most splendid evening. The final toast of the evening ‘to the Cutlers Company’ is traditionally proposed by the ‘Father of the Company’ and we are delighted that the honour falls to Past Master Ian Traill.